WIN a 5 Day All Inclusive Sable Hunt With Re a Lora Safaris! Have you been dreaming about a true African Hunting Safari experience? With the extra touch of luxury and attention to detail, we offer true value for your money! Here at Re a Lora Hunting Safaris we are all passionate about Hunting in Africa and the beautiful experience locked up in its wild nature. For us the dream of living in the African Bushveld and appreciating its beauty became a reality when we started Re a Lora in 2002. Re a Lora is Tswana for “our dream” – how appropriate! We are a family-owned business and is also owner-run on a daily basis. So if you are looking for a quality experience with fully qualified and passionate guides that are not just there for a salary – this is your place! Please do visit our Eco Tourism page for more information on the wonderful experiences we offer. As an added benefit, we also offer luxury accommodation at our private bush Lodge. Here you will sleep comfortably with wildlife on your doorstep. We can offer it to you on a self-catering, bed and breakfast and even a full board basis. Here you will have the privilege of sitting around a cosy camp fire whilst listening to the sounds of the African night! For the hunter dreaming about a sophisticated African hunt of exceptional trophies; a hunt that delivers on all you have dreamt about - please visit our hunting page to see what we offer! Where African Hunting dreams come true! 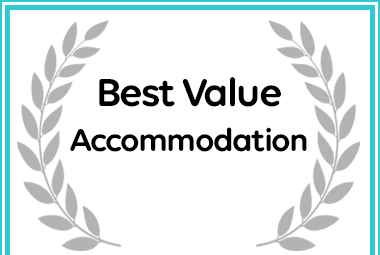 Re A Lora Lodge received a Best Value Destination Award from Afristay.com.